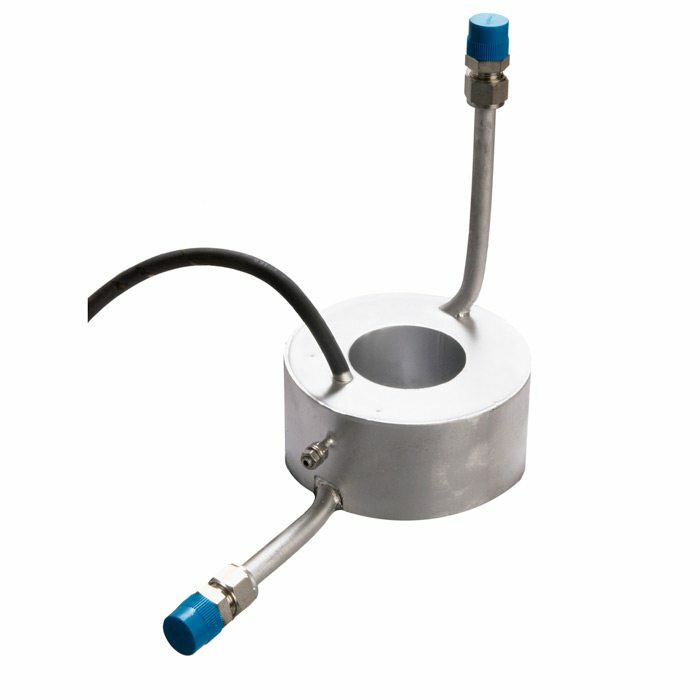 The natural gasheater type D-7800 consists of: A stainless steel tube for the circulation of the natural gas. A coiled tubular heating element is connected to a supply cable and fitted with an earth conductor to which the earth wire is fixed. The assembly is completely moulded in a compound casted in a stainless steel enclosure used as mould for the encapsulation. The explosion proof gas heater type D-7800 has been designed for heating small amounts of natural gas or other gases for pneumatic control, to prevent freezing up the pressure controllers by the well known ”Joule Thomson Effect” in temperature class T5 and T3. (ISSeP07ATEX038U) with a diameter of 8.5 mm. Material of the enclosure and tubular heating elements is stainless steel. Degree of protection Ex II 2 G – Ex e II T3 Gb (141 °C max.) or Ex e II T5 Gb (100°C max.) According EN-IEC 60079-0 and 60079-7. Working pressure 80 barg, test pressure 106 barg. Article number Output Voltage Temp. class Cable length Max. working temp.